Longoria wins her 9th US Open title. Congratulations to Paola Longoria, who captured her 9th career US Open title by defeating #3 Samantha Salas Solis 9,2,5. Paola has not lost at this event since 2010, when she was upset in the final by #2 Rhonda Rajsich. This tournament represents Longoria’s 84th Tier 1 or Grand Slam title, and she seems well on her way towards challenging Kane Waselenchuk‘s overall record for total pro titles (which currently sits at 111). Paola maintains her current stranglehold on the points lead on the LPRT; she is set to extend her current lead on #2 Frederique Lambert, who was vanquished in the semis by finalist Salas. The king wins his 14th US Open. Congratulations to #3 Kane Waselenchuk, who defeated #4 Daniel De La Rosa in two games 11,6 to capture his 14th US Open crown. Waselenchuk has not been defeated at the sport’s biggest tournament since 2002, when he lost in the semis to one of the sport’s previous legends, Cliff Swain. Waselenchuk, as is characteristic, did not drop a game in this tournament. He vanquished all comers in two straight, and instead of wondering who might beat him, or even take a game off of him, we marveled at the likes of DLR, or Andree Parilla, or Javier Mar … all of which achieved the amazing accomplishment of scoring double digits in a single game against Waselenchuk. In winning this event, he also extends his current on the court/non forfeit match winning streak to 66 games, which is third most in the history of the sport (behind only himself; Kane now owns the sport’s top three longest match winning streaks). Kane’s win, coupled with Rocky Carson‘s semi finals loss and Alex Landa ‘s quarter final upset will not be enough to return Kane to the #1 ranking on tour; he trails Rocky by more than that points delta. But with a couple more similar results, he’ll return to the top of the rankings table. http://www.irt-tour.com/singles-rankings/ . Congrats to Kane on winning the sport’s top prize, and we hope we see more of him going forward this season as the status of his retirement from the sport still seems to hang in the balance. Congrats to Alvaro Beltran and Daniel De La Rosa on their US Open Title. Here’s a review of the event. First off… for racquetball fans of top-level tournament play, you cannot ask for more out of this doubles draw. Out of the 22 matches in this draw, 14 went to tiebreaker. 13 of the first 19 went tiebreaker, including two 11-10 matches. Every time we run another top-end doubles tourney, we seem to get more and more great play. I love this new focus on doubles in the Men’s Pro game. An opinion from this observer: I wish the doubles qualified into the 16s and not the quarters: if there’s 23 teams entered it does seem unfair to give byes to four teams and force everyone else to play 2 or even 3 qualifiers. I’m not sure how this decision was arrived at, if its driven by court availability (possibly) or just attempting to protect the top seeds (also a distinct possibility), but the 5th seeds really have a massive disadvantage as compared to the 4th seeds. – First, we have to start with the unbelievable match we saw in the round of 32; The 5th overall seeds Jake Bredenbeck and Jose Diaz, who together as a team have made 3 finals in the last year, faced off against a team of 17-yr old phenoms in Sebastian Fernandez and Diego Garcia Quispe. Fernandez and Garcia had the 5th seeds completely flummoxed in the tie-breaker, running out to a 10-0 lead. However, Jake and Jose fought back, and saved off at least 8 attempts at match point across several trades of serves and came completely back to win 11-10. An amazing come-back that I can’t quite say i’ve ever seen in the pro game before. A quick note about the two juniors; they played top-level pro rball in this match and made a bunch of statement wins all weekend on the singles side. – Andres Acuña and Felipe Camacho got a solid win over a tough doubles team of Charlie Pratt and Dylan Reid. – Semi-regular IRT players Maurice Miller and DC-area native Troy Warigon teamed up to take out two accomplished IRT pros in Andree Parrilla and Gerardo Franco Gonzalez. – College buddies from Baldwin-Wallace Thomas Carter and Kyle Ulliman shocked the team of Jansen Allen and Nick Montalbano in the first round. The round of 16 had all four “seeded” teams end up winning to qualify to the main draw … but all four matches went tiebreaker. – David Horn and Mauro Daniel Rojas were stretched to 11-9 by the Miller/Warigon team. – Bredenbeck/Diaz went 11-8 to advance past the Costa Rican team Acuna/Camacho. – Top Bolivian team Luis Conrrado Moscoso Serrudo and Roland Keller (the 2018 South American Games champs and 2018 Pan Am Games finalists) took out the Baldwin Wallace alumni team 11-0 in the breaker. – Lastly, the tough Mexican team of Rodrigo Montoya Solís and Javier Mar had to go to extras to top the Denver duo of Adam Manilla and Nick Riffel. The Main draw featured some immediate upsets. – Jose and Jake kept living on the edge, advancing again 11-10 over the Colombian pairing of Sebastian Franco and Mario Mercado. – the Mexican team of Montoya & Mar took out the #3 seeds Alejandro Alex Landa and Samuel Murray in a tiebreaker. – The #2 seeds and reigning IRF doubles champs Alvaro Beltran and Daniel De la Rosa ousted the Bolivian pairing of Moscoso/Keller in a rematch of the 2018 IRF Worlds semi final. – Lastly, the #1 team of Kane Waselenchuk and Ben Croft, who havn’t lost a doubles match together since 2016, advanced over Horn and Rojas. – #2 Beltran/DLR were pushed to the edge by country-mates Montoya/Mar, advancing with an 11-8 tiebreaker win. The Final represented a rematch of several notable pro doubles matches over the past year: this was the final of last year’s US Open, which resulted in an epic match some called “the greatest match ever played.” This was also the final of the World Doubles event in Denver last May, which ended in a controversial call/walking off the court. On this night in 2018 in Minneapolis though, the Mexicans could do no wrong and took the doubles title by the surprising score of 11 and 6. It has been quite a year so far for Beltran and DLR; they won the Mexican Nationals, tnen won the world doubles title in Costa Rica, then took the 3-wall WOR doubles crown in Vegas just two weeks ago. We’re to the finals of the Pro singles draws. Lets review the semis, which together went according to prediction but also were surprising. – #1 Paola Longoria blasted #12 Gaby Martinez 5,0,3 to leave no doubt about who is the current top-dog in the sport. Longoria advances to the final in pursuit of her 9th US Open title. – #3 Samatha Samantha Salas Solis left no doubt about who the 2nd best player on tour is, advancing past current #2 Frederique Lambert in 3 games. It likely takes the first half of this season for Salas to make up the points gap, but she’s well on her way to regaining her #2 ranking on tour. So we get the expected final; the 47th LPRT meeting between doubles partners Longoria and Salas. Longoria leads the series 43-3 (https://bit.ly/2QAnMBA) and its a stretch to predict anything but another US Open title for Paola. – #1 Rocky Carson faced off against #4 Daniel De La Rosa. DLR looked sluggish and slow in game one as Carson rolled to a 15-8 win. But from there, DLR completely dominated, diving all over the court and making great shots. DLR upsets the #1 seed (8),5,5 to advance to his second ever US Open final. 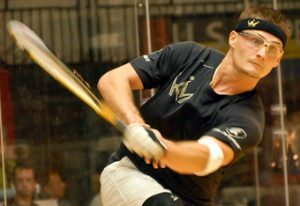 – #3 Kane Waselenchuk, in pursuit of his 14th US Open title (https://bit.ly/2yacvjI) , took down #10 seed Andree Parrilla in two games 3,12. The first game was a blow-out, but the second game was entertaining and competitive, with more than a few questionable/argued calls. But Parrilla hung with Kane til the very end. Final preview: Kane and DLR have met 15 times on tour (head to head report: https://bit.ly/2EcvuR4); Kane is 14-1 head to head … and that one DLR win was the Canoga Park final last January where Kane suffered his knee injury that took him out for most of last season. While DLR looked crisp both in the semis victory against Rocky and in the doubles final (more on that later), its a hard stretch so think he has a chance of taking out Kane. But DLR is the kind of player who can do so; he’s a shot maker on the court, he can dive and retrieve balls and make his opponent take that extra shot, and he can mix up his serve when needed. Nonetheless, Kane has been his typical unbeatable self this tourney. Prediction: Kane in two closer games. As with the ladies, 3 of the 4 top seeds advanced to the Men’s singles semis at the season’s major, and the fourth player to advance was no surprise entrant, having won one IRT event last season and made the finals of another. Lets review the quarters and project the semis and finals. – #1 Rocky Carson downed #8 Mario Mercado in two games with ease. Mercado did well to advance here, ousting IRF World champion Rodrigo Montoya Solís in the 16s, who many considered a dark horse to go deep at this tourney. But in Carson, Mercado ran into the master of the control game. – #4 Daniel De La Rosa took out upset-minded #12 Jose Diaz in two straight. De La Rosa ends up eliminating both Diaz’s in this event, putting and end to the Stockton clan’s tournament here. – #3 Kane Waselenchuk made a statement in his win over #6 Sebastian Franco 6,1. After getting pushed in the 16s by Javier Mar, Kane came out swinging and Franco had no answers on this day. – #10 Andree Parrilla provided the sole upset in the quarter finals, downing #2 Alex Landa in a tie-breaker. 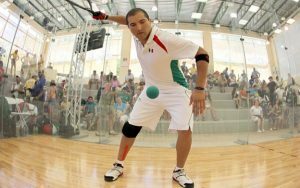 This is not as big of an upset as it seems; these two have played many times at the top levels of racquetball and Parrilla has had more than his fair share of wins. – Carson holds a 15-8 h2h career lead over DLR … but the last time they faced off (Jan 2018) DLR crushed him. Of course … that was Rocky’s first tournament back after knee surgery so that result needs an asterisk. Still, DLR has looked great this tourney and knows how to beat Rocky, so look for a DLR win to advance to the finals. – Kane and Parrilla famously met int he 2016 US Open round of 16, where Kane handed Andree a triple donut. At the time it was seen as a referendum on the fledgling WRT tour’s place in the racquetball heirarchy, but it is also worth nothing that Parrilla was a few days past his 20th birthday at that point and was a baby in terms of ability. The next time they met was an IRT Final a few months later. Kane is 6-0 against Andree h2h but they havn’t faced each other in more than a year. Meanwhile, Parrilla has been on a great run of form and can hang with anybody. I look for a decently entertaining game with Kane winning in 2, but by no means a blow out. Final prediction: Kane over DLR in their 16th top-level meeting. Today, the Thursday of the US Open, is perhaps my favorite day of pro racquetball all season. Two rounds of top-level pro racquetball on both the men’s and women’s side. Lets take a look at the notable Men’s matches from today and preview the Quarters tomorrow. IRT round of 32 notable matches. – Felipe Camacho got a solid win over Thomas Carter in the always-competitive 16-17 match-up, taking the tie-breaker 11-8. – In his first game back since his retirement talk this past off-season, #3 Kane Waselenchuk took out a player less than half his age, defeating Mexican 18U and current 16U world titlist Sebastian Fernandez in two. The kid is just 17 years old and played fantastically this weekend in both singles and doubles. – Alvaro Beltran, playing in his 19th US Open, was the first to advance to the 16s on the day, downing country-man Rodrigo Rodriguez, who was making just his second ever IRT appearance. – Veteran Charlie Pratt ended Bolivian 16U player Diego Garcia Quispe run 12,5 . Just to re-iterate; both Fernandez and Garcia are in their age 17 seasons. – Javier Mar upset #14 Adam Manilla 5,14. – Daniel de la Rosa took out Ricardo Diaz, the reigning US 18U champ, in his IRT debut. A great showing from Diaz on his pro debut beating two very solid IRT semi-regulars in Nick Montalbano and Troy Warigon. – Huge upset win for Andres Acuña, downing #11 David Horn in a tiebreaker. Two straight one-and-dones in the first two IRT events for Horn, who lost his opener in Laurel as well. Not a great start to the season for Horn, who made a big step forward last year by making his first semi and first final. – Mauro Daniel Rojas stretched #6 seed Sebastian Franco, but the Colombian prevailed 11-8. – Maurice Miller gave #2 Alex Landa a scare, taking the first game before falling in a tie-breaker. in the 32s and sends home Moscoso much earlier than last year (when he ran to the quarters in his only prior IRT appearance. – In a surprise to me, #8 Mario Mercado came back from a game down to top current IRF World Champ Rodrigo Montoya Solís. This observer thought Montoya had a good shot at making the finals in this event; I wonder how much Montoya’s recent ankle injury has affected him this week. – #12 Jose Diaz got perhaps the best win of his career with a tie-breaker win over #5 Beltran. Some post-game drama; reportedly Diaz was 25 minutes late to this match but was not penalized or forfeited. – Javier Mar more than held his own in losing to #3 Waselenchuk 12,10. – #10 Andree Parrilla easily handled #7 Murray, perhaps worn out from a brutal earlier victory. Parrilla has now made the quarters in 4 of the last 5 IRT events he’s played, and 7 of the last 11 stretching well into last season; that includes a win and a final too. He’s a dangerous opponent who is one or two more big results from being a protected seed going forward. 6 of the top 8 seeds ended up advancing, setting up some very solid match-ups in the quarters. Run the top-20 tour-wide Head to Head matrix (link here: https://bit.ly/2yf522N) to fire off a new Head-to-Head “Tale of the Tape” report complete with pictures, biographical information and detailed match history for players in the IRT top 20. – #1 Carson v #8 Mercado: Rocky is 6-0 lifetime against Mercado on the IRT, and despite Mercado’s great win today, I see Rocky making it 7-0. Both are control players, but Rocky will out-control Mario’s control game. – #4 De La Rosa vs #12 Diaz: DLR is 4-0 against Diaz on the IRT, and is playing really solidly this week. Diaz fights for every point and punches above his weight class though, and won’t go down without a fight. – #3 Waselenchuk vs #6 Franco: Kane is 2-0 over Franco lifetime, but despite Franco’s crisp play you never bet against the king. – #2 Landa vs #10 Parrilla: Landa is 2-1 over Parrilla on the IRT, but 6-2 lifetime across multiple tours and Mexican National events. They’ve had close games and blow-outs. Parrilla seems like he’s in every match these days, and quietly he’s made the quarters in 4 of the last 5 events, and 7 of the last 11 pro events, a span that includes a win and a finals appearance. Landa will need to be “on” out of the gate. Prediction: going chalk; 1,4,3 and 2 into the semis.